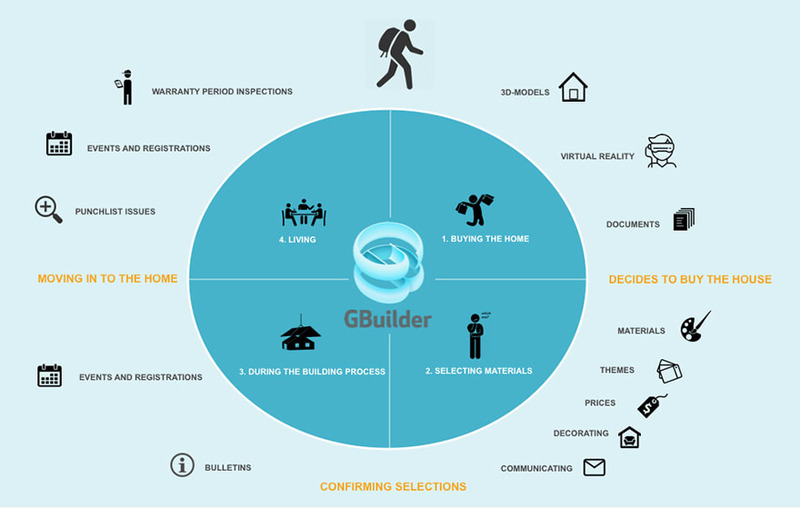 A Finland based software company GBuilder has created a BIM-based solution for housebuilders to enable them to more easily customise homes and provide a more accurate model of the building process from first contact to sales, through construction and into the warranty period and after-sales service. The software offers a visual web-based user interface and Dynamic 3D/VR/AR models that can be configured, decorated and shared. “We are combining unique 3D, virtual reality and augmented reality models of thousands of apartments around Finland and the Nordic countries that are updated in real-time as the home buyer or builder make decisions about the materials or make changes to the floor plan,” said Harri Majala, CEO, GBuilder. “We are creating something that we have not seen anywhere else in the world. GBuilder is designed to solve issues concerning customer management and the digitalisation of the customer journey in the construction sector,” added Majala, who also has 15 years’ experience as CEO of a construction company. Housebuilders in the UK are under increasing pressure to improve housing quality and the Hackitt Review has recommended Level 2 BIM be used for all higher risk residential buildings. GBuilder’s 3D models include accurate information from architect drawings, including measurements, rooms, surfaces, fixtures, doors and windows. GBuilder acts as an online design studio where home buyers can easily visualise their new home: comparing different material options and fixtures while keeping track of the budget. Construction companies can use the software to upsell pre-priced options online and the home buyer can make selections and confirm them online. The digitalised customer journey enables reliable communications between the home buyer, construction company and other stakeholders as orders, quantities and punch lists are updated in real time. GBuilder makes it possible to send messages, save pictures and videos and share them in social media or by email. Home buyers can conveniently follow the progress of the building work and the construction company can maintain a high level of customer service after they have moved in. “Our main markets are currently in Finland and Norway, but we also have a pilot project in the US and are participating in a business accelerator in Austria which has enabled us to demonstrate the product to construction companies in the DACH area. We are also finding some traction in the UAE and the UK and will explore those markets further in 2018-19,” said Majala. The company says GBuilder is for off-plan projects. During the building phase, the build site has access to the information, for example which materials to fit in every unit, which reduces mistakes, saved time and money. During the after-sales/warranty period, the home buyer can report any errors etc to the builder who will then assign them to be fixed.